fall is one of my favorite times of year (not that we get to experience it much in southern california). i love going to the pumpkin patch and picking out pumpkins, deciding on the *perfect* face to carve on my pumpkin.....and best of all is toasting the pumpkin seeds. alright, i will admit it. i am not a big fan of digging through all of the goop and slime to harvest the seeds....but the end product puts a smile on my face every year. heaven. 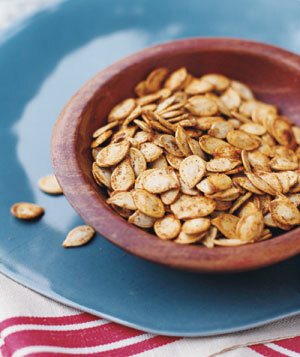 spread the pumpkin seeds on a medium baking sheet. drizzle with oil. sprinkle with salt. bake 45 minutes in the preheated oven, stirring occasionally, until lightly toasted. above is for the "classic" toasted pumpkin seeds. they are my favorites.....but below are some fun variations on the classic that are super tasty as well--enjoy!